The printing press, the pencil, the flush toilet, the battery--these are all great ideas. But where do they come from? What kind of environment breeds them? What sparks the flash of brilliance? How do we generate the breakthrough technologies that push forward our lives, our society, our culture? Steven Johnson's answers are revelatory as he identifies the seven key patter The printing press, the pencil, the flush toilet, the battery--these are all great ideas. But where do they come from? What kind of environment breeds them? What sparks the flash of brilliance? How do we generate the breakthrough technologies that push forward our lives, our society, our culture? Steven Johnson's answers are revelatory as he identifies the seven key patterns behind genuine innovation, and traces them across time and disciplines. 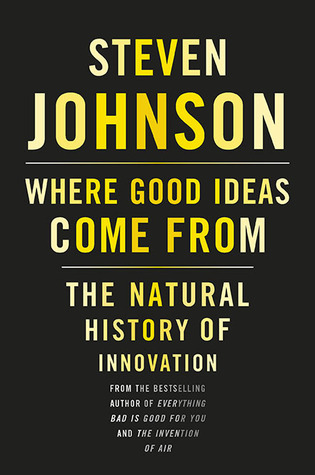 From Darwin and Freud to the halls of Google and Apple, Johnson investigates the innovation hubs throughout modern time and pulls out the approaches and commonalities that seem to appear at moments of originality.